I’m not a great housekeeper. That is not to say that I don’t enjoy a clean house or that I don’t want to be a good housekeeper. I do and I do. But for some reason, clutter stacks up, laundry piles up, and dust gathers. I work hard at keeping my house tidy, but I don’t seem to be able to stay on top of my household chores with the seeming effortlessness that some other women do. I could blame it on too much time blogging or on Pinteresting. But many of my tidy friends blog and Pin too. 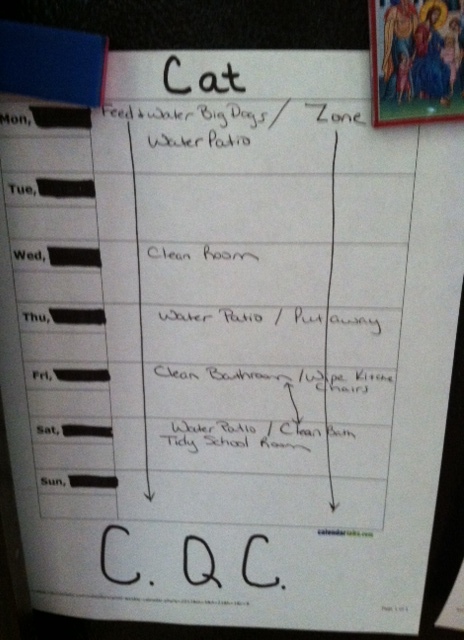 My kids’ crazy schedule? My friends with scrubbed floors and spotless kitchens have kids too. My two hour daily workout? Ha! I wish! The fact is those women – the ones you can drop in on any time and they don’t feel the need to explain why there is laundry on the dining table or a tequila bottle on the front porch (actually that one is a pretty good story) – those women got the organization, time management gene. I did not. My mother has it. Her mother had it. But somewhere there must be a recessive disorganization gene in my family, and I got it. Yes, I’m blaming the ring around the bathtub and the layer of dust on my mantle on genetics. I’ve heard worse. At least I’m not throwing in the dirty towel (that was probably left in the bathroom floor for a couple of days). Instead I am constantly devising plans to try to make my housework more manageable and the messes less overwhelming. Some of my plans, like saving all my 37 loads of laundry for one day (and night) a week, have been a bust. Others, like getting a house dog to snarf up crumbs off the kitchen floor, have been a great success. This summer I resurrected an old system I used when I was homeschooling, and I must say it is making a big difference, especially now that the children are older and can take on even more responsibility. First of all, each of the children has a chore chart. Duh. I know other families have used them for years, but we get busy and forget ours. Not this summer! Some chores are daily others are weekly. Either way, it’s simple. You don’t get to go swimming or have friends over unless your stuff is done. And we are big time summer party people. I want almost everyday to be a party in the summer. For this to happen, people have to be able to come over without me suffering ignominy and disgrace.The brilliant thing about the new and improved chore charts is that they include some important jobs that I don’t necessarily think of as house work, and that I rarely seem to get to – like watering the houseplants or cleaning the bird poop off the front porch. Another clutter breakthrough – each child has a zone (the kitchen, living room, etc.) By the time Daddy gets home, everyone must have his or her zone tidied. Sometimes, when stuff begins to pile up and get on my nerves during the day, or if we are expecting company, they have to do a ten-minute tidy to get their zones looking spiffy. The charts and the zones have been a tremendous help – easy solutions that we will continue into the school year. But by far, the biggest coup over household drudgery has been my C.Q.C. policy. C.Q.C. stands for CHEERFULLY, QUICKLY, AND COMPLETELY. No whining. No fussing. No complaining. No dawdling. No slacking. Of course it is normal for kids to grump when they have to do chores – normal, but not acceptable. I think sometimes we as parents get so used to the stereotype of the “typical American kid” that we sometime accept behaviors and habits (whining, eye-rolling, sass-mouthing, etc.) that are at best disrespectful and at worse are forming habits in our children that will make them unpleasant adults – we’ve all worked with these Debbie Downers and Negative Neds. I do not want my children to grow up thinking it is their right, privilege, and duty to complain about things they don’t want to do. I want my children to learn that cheerfulness is a virtue. You don’t have to like scrubbing the toilet. You just have to act like you do! If one of my blessing begins to complain, I simply shout through my teeth C.Q.C.!!!! No, not really, I lovingly remind (sometimes with threatening undertones) that if a job is not done cheerfully (or at least in pleasant silence) it isn’t done well. This simple set of letters has made daily chores go much more smoothly. Why didn’t I think of this before? Of course this new system only solves part of the problem of daily chores. The children are efficient, reliable, and pleasant…if only I could leave ALL the housework to them! Oooops, I guess that didn’t sound very cheerful!